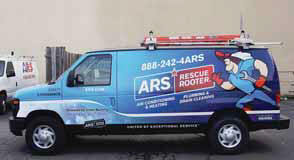 ARS/Rescue Rooter Employs Propane Autogas Vans in Houston. “After researching several fuel options, we decided that ROUSH CleanTech propane autogas systems offered the best solution for us,” said Mike Baessler, fleet director of ARS/Rescue Rooter. “We believe this investment will provide longevity to our fleet, in addition to reduced operating costs allowing us to pass the savings on to our customers.” “Propane autogas powered vehicles help reduce our country’s dependence on foreign oil because 90 percent of U.S. propane supplies are domestic,” said Todd Mouw, vice president of sales and marketing at ROUSH CleanTech. • 17 to 24 percent less greenhouse gases. • 20 percent less nitrogen oxide. • Up to 60 percent less carbon monoxide. ARS/Rescue Rooter plans to purchase 22 more vehicles by year-end, with an additional 100 or more vehicles planned for 2012, spanning multiple markets. There are thousands of propane autogas refueling stations across America, with stations in every state, making this a realistic, cost and environmentally conscious decision for ARS/Rescue Rooter in its Los Angeles and Houston branches and beyond. The company is growing nationwide, both organically and through acquisitions, with recent acquisitions including: Brothers in Rock Hill, South Carolina, McCarthy Services in Alexandria, Virginia, Conway in Memphis, Beutler HVAC in Sacramento and Dallas-based Efficient Attic Systems.